The Adel Systems CB battery chargers are a range of microprocessors controlled chargers. Based on switch-mode technology, they produce an output voltage stabilised at a preset value, even when not charging the battery. These battery chargers have three charging levels- recovery, boost and trickle charge. All the chargers have a relay output for a range of battery bank protection functions: Replace battery or Flat battery; Fault in the main; that is High voltage at the battery ends; Open or sulphated battery; Reverse Polarity, Short-Circuited element and Wrong Battery Voltage. The intelligent battery chargers control and maintain batteries charge state ensuring optimum recharging over time. Once the batteries have been charged in accordance with the multi-stage principle, using, recovery, boost and then trickle charge, the CB battery chargers check battery every 110 minutes. The status of the battery is monitored so it only receives the current required., this prevents damage to the battery and prevents the battery being permanently under charge. All of the modes are controlled by the CB charger and there is no requirement for an external input signal or timers. 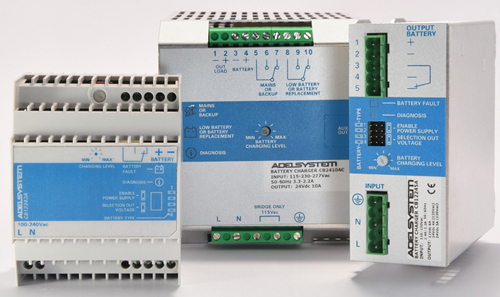 The majority of the ADEL SYSTEM battery chargers are housed in an aluminium case and are designed for DIN rail mounting. Two version are available in plastic cases. They are manufactured in Italy. ♦ Relay output for diagnostic functions contact signals as "Replace battery"; "Flat battery"; "Fault in the main"; that is: "High voltage at the battery ends"; "Open or sulphated battery"; "Inverted battery connections"; "Possible short-circuited element"
MODEL NO. INPUT OUTPUT DATA/CAT. Models CB123ALC, CB126A, CB243ALC, CB245A are being discontinued - Should you require one of these models, please contact us, a small stock might still be available.